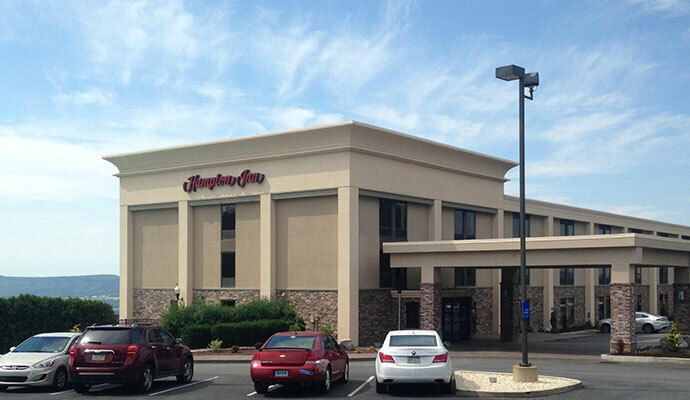 Hampton Inn Hazleton is a 122-room hotel located at the intersection of I-80 and I-81, a 7-minute drive from Hazleton Municipal Airport and 10 minutes from Downtown Hazleton, PA. The hotel is centrally located less than 2 hours from New York City, Philadelphia, Harrisburg, and Scranton. The hotel features free WiFi, a business center, an outdoor pool and a modern fitness center. Guests can start their day with a free hot breakfast, or grab a free Hampton On the Run Breakfast Bag for a quick, healthy meal to go. Our team is on hand to make sure everyone’s stay is hassle-free.